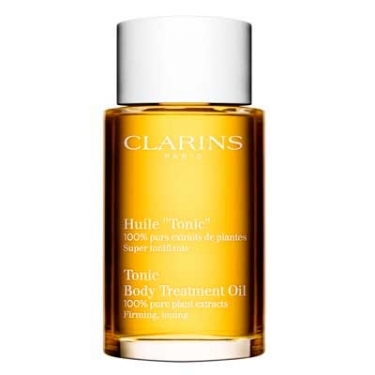 Tonic Body Treatment Oil is an energizing plant oil infused with rosewood, mint, rosemary, geranium to tone and fragrance skin for a feeling of well-being and relaxation. Also contains hazelnut oil to lock in moisture and nourish skin. Apply a small amount to damp skin, over the whole body or concentrating on problem areas. Gently massage and follow with a cool shower if possible. For best results, use a Clarins exfoliator once a week. Particularly recommended during pregnancy.